Reserve now by selecting the class/event title or selecting the quantity at the bottom of the page. The California Native Garden Non-Profit Foundation (CNGF) invites you to join us on Saturday, September 20th from 5 to 10 PM at the Middlebrook Center, 76 Race Street, San Jose, CA, for an elegant evening of dining and music at our Eating California Fall Harvest Festival. The Festival will culminate CNGF’s Eating California Native Edible Eating series, a partnership with The Red Basket Chef, a line-up of cooking, designing, and tasting workshops that are taking place on several Saturdays throughout the summer and early fall of 2014. The culminating Fall Harvest Festival will also serve as a finale to the many projects and events related to sustainability, garden design, and food taking place at the Middlebrook Center this summer. The Festival will capture the essence of the mission of the California Native Garden Foundation–to provide the next generation the knowledge and resources necessary in order to create a prosperous future society based on the ideals of healthy living and the preservation of the natural world. 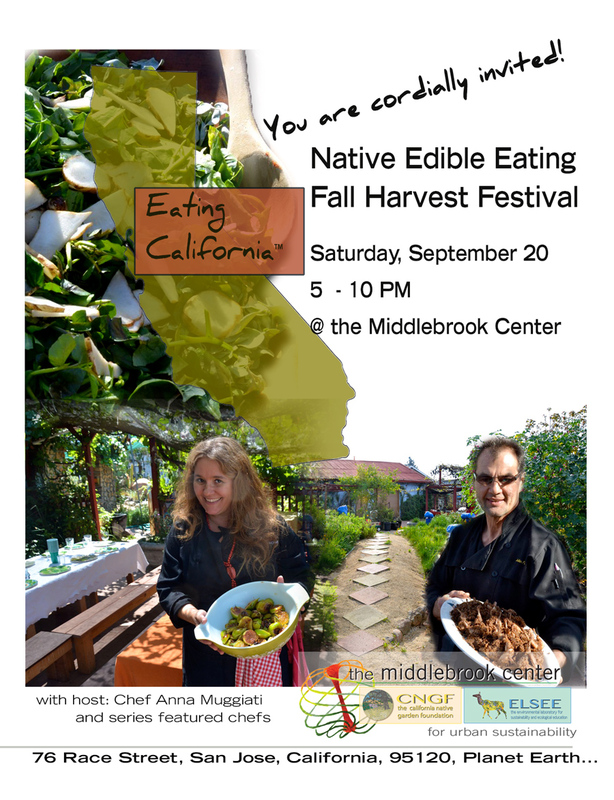 The menu will be inspired by the Eating California Native Edible Eating Series workshops. Each dish on the menu, developed with The Red Basket Chef, has been selected based on its sustainable properties. Many dishes use perennial and drought-tolerant plants in order to decrease energy and water use in our modern world. They also relate to the relevance of eating local and native edible plants and tying flavors back to their roots in different ethnic cultures around the world. The chefs who are being invited to take part of the event will revisit classic recipes drawing from their own ethnic backgrounds and those in which they have expertise. These include flavors from the Mediterranean, South America, France, Italy, and Japan. All proceeds will go to the CNGF in order to fund such projects as internship programs, aquaponics systems, and the Enivonmental Laboratory for Sustainabililty and Ecological Education (ELSEE) model. The ELSEE model is currently being implemented in around 50 schools around California to encourage the use of project-based learning in classrooms. In addition, a portion of the proceeds will go to the Garden for Ghana Project, a current effort by local youth to help environmentally restore a village across the world. All projects will be featured at the Festival. This year, we will present a special showcase on our progress on the Garden for Ghana Project in Yamoransa, Ghana, through a special presentation by Alrie Middlebrook and local students involved in the effort. Come learn about what they are doing as a high school club to help environmentally restore a village across the world! Alrie will also showcase her successful experience completing the first pilot project last May. You can help by contributing to the silent auction at the event. This festival is an opportunity to learn more about both the California native culture and cultures from across the world. By tasting local and fresh foods straight from the fall harvest and contributing to the programs here at the Middlebrook Center, you are sure to support healthy and sustainable lifestyles both near and far!